The Moto G6 Plus is the crown jewel of Motorola’s G series. But the new device comes with a challenging mission: to offer a mid-range at a competitive price that will appeal to more demanding users, both in terms of its hardware and software. Will the Moto G6 Plus be able to pull this off? We take you through all the pros and cons in this review. The protruding circle at the rear, which makes up the look of virtually all the brand's handsets in recent years, is still present, but the Moto G6 Plus no longer looks like the mid range G. It and the others have become more like Moto X4, mainly because of the back finish in glass and the velvety sheen that it brings. The color of the unit I got for testing is the Indigo blue (for now it only has one), a very dark and elegant tone. No one imagined that one day the elegant adjective would be used in the Moto G line, but that is the case here . The circle of which few enjoy is still high, the rear brings the visual effects of the Moto X4, the corners are well rounded and the footprint is great on the sides, and the straight back that does not accompany the ergonomics did not bother much. Liquid repellent technology is present, but it is not waterproof. The rear also has the extra microphone on the bottom, and the dual camera looks like a little face next to the flash. Above is the cradle for the cards and a microphone, while the right side houses the volume and power buttons. Below is the audio and USB-C connection, and the front has a lot of things: camera, sound output, flash, screen, company logo, biometric sensor, flatter and a third microphone. It is very large, but its 8mm leaves it thin and the 167 grams help to be light and easy to use overall. The only thing that worries are the sides, which imitate scintillating metal but are made of plastic. 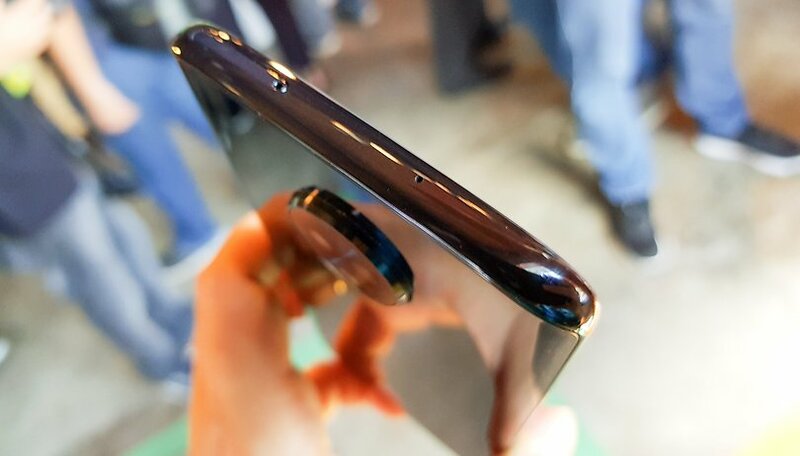 Motorola claims that this better absorbs falls, but it does feel more fragile. If you're looking for a big screen with good performance , but without paying so much, you might end up enjoying the G6 Plus. With 5.9 inches that take 75% of the front of the device, it brings Full HD + resolution of 1080 x 2160 pixels and 409 ppi of density. It's a 18:9 screen, the first that Motorola launches, and named Max Vision. The technology is IPS, since the company saves the AMOLED for more expensive handsets, but I did not see any problems here. It does not bring those intense colors, but it has been well balanced and with good viewing angles. The glass protection is Gorilla Glass 3, but we realized that there was not much effort from Motorola to remove the bezels here. They are certainly thinner than previous generations but still too large for the current trend. Again, this feature is being reserved for the more expensive handsets. The two biggest defining factors of Motorola handsets (practically the only ones, incidentally) are its biometric sensor and Motorola's special apps . These two functions streamline the use of the system and bring good and simple improvements to those who seek practicalities. The biometric sensor is smaller, but continues with the same special features that have appeared in the last Moto. In addition to unlocking the device with fingerprints, it also saves passwords, locks the device again with a touch of any finger and helps in navigation. Drag to the left is the back, to the right is the multitasking. This eliminates the onscreen buttons and you gain space, but you can disable them if you do not like them. If you keep touching, you'll open Google Assistant. This function is inside the Moto app, which brings the other functions that are characteristic of Motorolas. You slide your finger across the screen to make it smaller, capture a screenshot with three fingers on the screen, shake the device to turn on the camera, change the camera or turn on the flashlight, among others. The Moto Screen activates the blue night filter, does not turn off the screen while you are looking at it and shows notifications, with quick action rights, on the screen off. They are functions that already please the users of the brand, but that can be simple for those who just like having many functions in the device. Among the new features we have Moto Voice, present in the G6 Plus in its Beta version. As all brands are presenting their own digital assistants, Motorola has brought that one. And we hope that it will even improve the app, as it has been basic, with just a few commands and functions. Glad that the Google Assistant is present and replaces it well. Finally, and for the first time, the best G line device has built-in HD Digital TV. To use it is necessary to connect the antenna that comes in the box, and with the screen of almost 6 inches this can be a differential for those who do not want an input device just to watch TV. It is no longer correct to say that Motorola's system is close to pure, but it remains relatively light and non-intrusive . It is still the interface that least brings functions and customizations, good for those who want to invest in a launcher. The G6 Plus already comes factory with Android Oreo 8.0.0, and the manufacturer has confirmed that it will be upgraded to Android P without giving date details. From the branded gadgets that came with Nougat, the difference of visual is not very big, and what most changes is the area of shortcuts. What's more, Motorola's own modifications, with rounded icons, transparent application dock and drawer, and the special apps that add the company's spice to the device. In the area of settings and applications, Motorola has added its typical in-house touch. Likely in an attempt to get what good the Moto X4 had (unfortunately not the protection against water), the hardware set of the Moto G6 Plus is the same as the X-line, with Qualcomm Snapdragon 630 chipset, 4 GB of RAM and GPU Adreno 508. Of internal space are 64 GB, of which 45 GB are free to the user. There is also microSD card slot up to 256 GB. It is not hybrid and the cradle is huge to accommodate this card and two more nano SIM chips. In the connections it brings Wi-Fi a/b/g/n/ac dual-band, Bluetooth 5.0 with A2DP, LE and EDR, NFC, GPS with A-GPS, GLONASS, GALILEO and BDS. The game of the moment for Android is PUBG, and I could not fail to test it. With the suggested graphics to a minimum I did not have any performance issues, and the game went through without lags or crashes. At the same time, it did not heat anything during this heavier usage. In general usage it works well, depending on the apps you use . In the multitasking test I called several apps and it returned to all without having to restart. But when I called apps like Chrome or PUBG, it turned off several of the simpler apps, but not those two, showing that it reserved its memory for those heavier apps. Other highlights announced by Motorola in the G6 line are Dolby Audio support, with an exclusive app to control this feature. However, with only one sound output, split with the output for the calls, it must be said that there are no miracles it must be said that there are no miracles. It's a loud sound, and a lot of people will like it because of it, but it bursts into the treble. Of course you can adjust this in the Dolby app, which is even in the shortcuts area, but you need to know more about sound to fit properly and get better songs. There are pre-defined profiles, but they are few. Dolby works for other media as well, and lets say it works great for games, where treble works well. For movies it will need some tweaking. Overall, it is best to wear headphones. The ones that come in the box are intra earphones and have flat cable, the sound is well balanced but are a bit low. The headphones also serve as an antenna for the FM radio. With each new device, Motorola adds features to the camera, showing that it wants to please the most impatient consumer , the one who wants to pull the smartphone out of their pocket and make a cool photo, than one who values the high quality and definition of the image. Still, the setup is good, with the rear accommodating a dual 12MP/5MP camera with apertures of f / 1.7 and f / 2.2 respectively. At the front, an 8 MP f / 2.2 aperture camera. The manual mode is maintained and the shutter speed is from 1/6000 to 1/3 second. It features dual pixel technologies, auto focus with phase detection, dual LED flash and automatic HDR. The rear camera makes videos in 4K at 30 fps or Full HD at 60 fps, while the front camera makes videos in Full HD at 30 fps. There are several special features offered. In addition to portrait mode, it features image cropping in the photo, highlight color, animated effects (Instagram style filters), slow motion and time lapse. The interesting thing is that the front camera also has these last two, plus the group selfie feature, which makes a panorama to get more friends. Portrait mode is good, but has difficulty with some more difficult parts like glasses and hair tips. The quality of the photos is very interesting for the model and the brand. Even in difficult light situations granulated less than expected, made pictures with very good details and the colors fall more into the warm, which pleases me. I took many photos slightly out of focus or blurred, sign that the camera is not very fast in these functions. But a photo in which you wait five seconds to capture is already far superior. Images in contrast situations had mixed results. I liked the quality of the portraits made with the rear camera and the zoom also pleased. The front camera brings colder colors, and although it has less detail, but also found the selfies well done. For videos, it makes cool stories, but with just good quality. There is AI use for object recognition, and the results were pretty cool on a number of occasions, where I even found the same model of sneakers I was wearing in a store. To try and keep the larger screen bright, the G6 Plus comes with a 3,200 mAh battery, two hundred more than the Moto X4 and Moto G5S Plus. However, the screen has its price, even more with the Moto Screen on a display that is not AMOLED. I got 7 hours and 20 minutes of screen in my daily use test, and in more intense use it reached 7 hours as well. The daily usage time was 14 and a half hours, more than enough for a day's work with transportation and a little home use before recharging, which took 1 and a half hours in its total. It comes with a 15W TurboPower charger in the box (plus a clear TPU case to protect the handset), and 15 minutes of charging ensure more than three hours of moderate use. The Moto G6 Plus is no super-revolution from Motorola, but it has shown the expected evolutions for the line. Long time ago the most popular companies like ASUS and Motorola stopped making plastic smartphones in their most famous lines and are raising the quality and price of their handsets. In performance, the G6 Plus is similar to G5S Plus, but brings better cameras, better screen and sleeker design. The price is already falling and it seems to be a great option for those who do not want an older device like Z2 Play, but that needs performance. In some ways it may not be a better option than the Galaxy A8, but it's one of the best mid-year releases of the year, for sure. The pressure is on: what's Lenovo doing with Motorola? In the Moto G line, the AI still seems rather dull, but the Z3 might bring better news on that subject. Moto Voice, still in Beta, is a draft of what we know can be done, like the Google Assistant itself. The audio was really what annoyed me the most, but other cons were not enough to stop me from recommending the G6 Plus. What do you think of the Moto G6 Plus? To bad they went with glass. Otherwise it seems an excellent value. I bought three G5plus, but only kept two for my wife & son. I bought the Essential PH-1 on the BF sale. I've been very pleased with Essential's frequent camera updates, Oreo 8.1 update and monthly security updates. Not so much with Moto which is still at 7.0 and severely lagging in security updates. I wonder if Moto will even honor their promise of an eventually update to 8.0. Yuk, shades of OnePlus who promised an update to the OP2 then renigged on the promise. I'm so done with smartphone makers who fail in support of their customers. Nope....glass on the front, obvious, but on the back? 1. Too easy to break/scratch. 2. BIG fingerprint magnet. Glass back is a fail. The g series has been my go to for hard use cases. For teenagers, outdoor use where its casual robustness and low price made it work well but not a big loss if dropped or damaged. And they always survived that use intact. No more. The g5plus was probably one of the best releases from Lenovo. Will the g6plus follow suit? A bump on the battery to 3200mamp be good enough for a power hungry display? If priced right it just may succeed like the previous model. Will be watching anxiously!